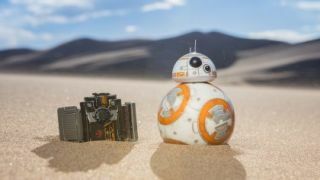 It was the breakout star of Star Wars: The Force Awakens, and the model for many a great toy. But none were better than the remote controlled BB-8 Sphero - and it's now had a lightsaber taken to its price tag for Black Friday. Amazon is offering the app-powered roller for just £77.99 at the moment, knocking £52 off the usual asking price for a 40% saving. R2-D2's spherical sibling hooks up to a smartphone app, letting you roll him around your house, cheeping and beeping with movement uncannily like his bigscreen counterpart. Pop him in front of The Force Awakens movie and he'll respond to the action onscreen, while you can also se the app to send holographic messages to your friends, just like in the Star Wars movies. BB-8 was hard to come by last year, so it's great to see it now sitting at a more affordable price point ahead of this year's Christmas rush.